If you're looking for a luminous, energy-saving, retro-style bulb, then look no further than the Newhouse Lighting S14 2-watt LED bulb. These stylish bulbs are available separately as replacements to our popular outdoor string lights. You can even upgrade your 11-watt incandescent bulbs to these energy-sipping leds (retrofit your Costco purchased string lights with these LED light bulbs!). upgrading saves 143 watts of energy when using and lasts 5x+ longer - double savings over the life of the bulbs! these bulbs are durable, dimmable up to 50% and come in a pack of 3. These bulbs also work great in any E26/medium/standard base light fixture! 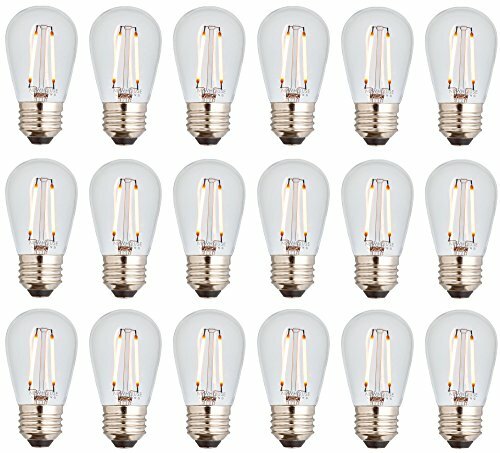 18 bulbs included (15+3 free!). Newhouse Lighting: defining life’s brighter moments. SPECIFICATIONS: This pack includes 18 LED light bulbs (3 free bulbs included) that fit in any standard/medium E26 base. These outdoor string light bulbs are S14 rated at 2 watts. Each glass bulb measures 3.8 inches tall and 1.8 inches wide. HIGHEST QUALITY: Our string light bulbs are perfect for outdoor or indoor use and can stand up to any weather condition. As an added benefit, these LED light bulbs shine with 200 lumens/bulb, are dimmable up to 50% and cast a beautiful warm glow. ENERGY SAVINGS: Our LED bulbs are built to last 5 times longer than incandescent light bulbs. Our light bulbs are rated to last for over 10,000 hours saving you over 75% energy usage over incandescent bulbs. VERSATILE: Ideal for outdoor patios, bars, restaurants, front porches, gazebos, pergolas and more, our outdoor string light bulbs are perfect for any environment. SATISFACTION GUARANTEED: This product comes with a 1 year warranty against manufacturer defects. We know you'll love our outdoor string light bulbs. If you have any questions or concerns about your product, feel free to reach out to us.